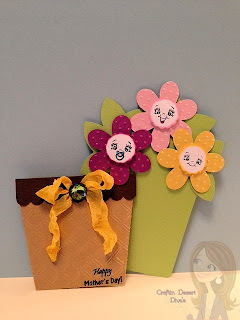 When I saw this Flower Pot Card Kit by Lori Whitlock I knew I had to do this for my moms Mother's Day card. I like that you can take the card part out of the flower pot base. Look at those darling little faces!! PK1200 The Moodies Face Asst. Now onto the winners from the two hops I was in this weekend. Are you ready??? Congrats!! Please email me at tbruening@cox.net with your address. You have one week to claim your prize. congrats to the winners! Love that card! So cute :). Cograts to the winners. What a cute card tars. Love the faces. Congrats to all the winners!!!Yiippee!! Oh!...wait a second that's me..LOL! 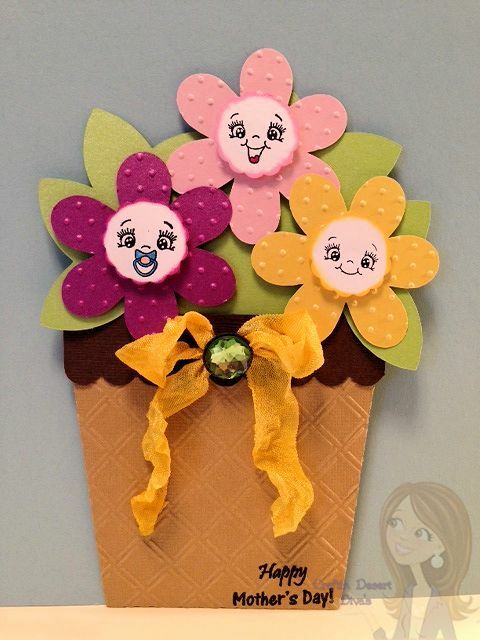 Love your BEAUTIFUL flower pot card!Stinkin Cute PK faces. 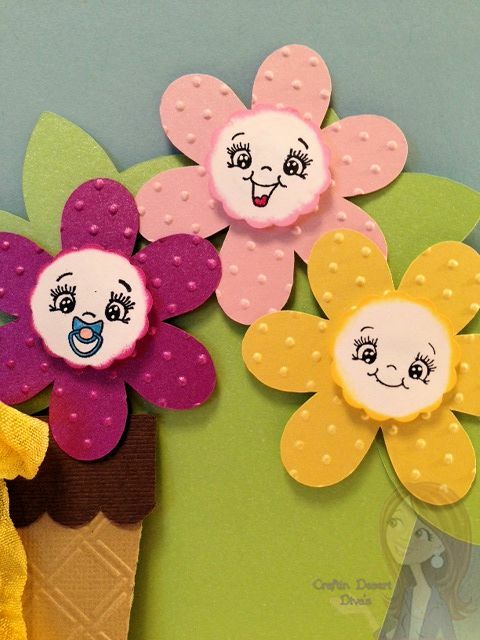 Would Love if you joined us at Cut It Up "Mother's Day" Challenge. Super cute! Congrats to the winners!! So Cute! Love the PKS faces! Thanks for joining us at scrappy moms stamps! Just adorable...love the face stamps!!! Way to cute Tara! I love the cute flower pot card and the darling faces are so darn cute! Congrats to your winners! This is adorable Tara! I also purchased this file but haven't had a chance to create the card. Thanks for the inspiration to create it and joining in on Scrappy Mom's Terrific Tuesday Challenge! I can see why you wanted to make this card and I love the way you used PKS for the middle of the flowers. Congrats to all the winners. Love your card!This is to cute!!! I love this card shape too! Your sweet Peachy Keen Moodies set are perfect for the centers. Well done! What a super cute and fun card. Thank you so much for playing along with Silhouette Challenges!! We hope you join us again. Good luck! I LOVE your flower pot card!! What a GREAT mother's day project!!! Thanks for sharing Tara and have a GREAT hump day! This flower pt card is adorable!! I am loving the PK faces in the flower centers and I love that bow on the flower pot!! Congrats to the winners!!!! Sweet, sweet, sweet - the perfect card for Mother's Day. Thanks so much for joining our challenge this week at Peachy Keen Stamps! This card is so pretty! Your flowers are adorable! Great flowerpot! Thanks for joining us in this week's PK stamp challenge! LOL OMG the little face are adorable! The one with the pacifier is my fav....so stinking cute! Love the card....great job! Thanks for playing along with Silhouette Challenges!! This is such a cute card. I love those little faces. Thanks for playing with us at PTT. Remember to display the Party Time Tuesdays badge to be eligible to win prizes. What a super design! Those faces are so cute and I love the way you embossed the petals too! Love the flower pot card, they are always so cute. Thanks for joining us at My Craft Spot. Dont u just love Lori Whitlocks files! ?